Your parenting plan can be printed in true calendar format, one month per page, showing all of your parenting plan overnight stays and day visits with appropriate titles, headers and trailers. Each overnight stay or day visit will be shown in the colors that were optionally selected on the Preferences form along with pickup and drop off times. The overnight stay and day visit reasons are also included (as much as will fit within a date box). The general appearance of each month is very similar to that shown on the program main form. For the standard and deluxe calendar programs (single years) 12 pages are required while the 2-year program requires 24 pages. To save ink/toner, printer options allow printing only selected pages when desired due perhaps to minor changes to the parenting plan affecting only a few months. You can optionally print your colored parenting plans in black and white for additional colored ink/toner savings. Printer options also allow you to "print" your parenting plan to .jpg formatted files for easy sharing with others or emailing to interested parties. This means you can develop and share your parenting plan in color, but optionally print in black and white to save ink/toner. Depending on your printer capabilities, the twelve page calendar can be sized to print on any size paper stock. 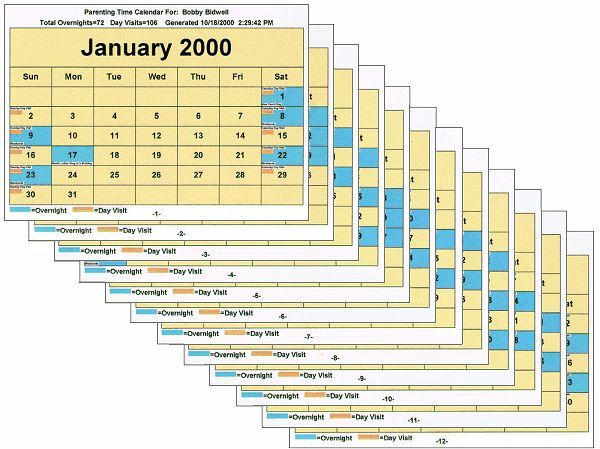 Note: To print out the twenty-four (or twelve) page calendar you need a Windows(TM) compatible, graphics capable printer.